If you suffer from diabetes, keeping your blood sugar stable is not just a recommendation--it could potentially save your life. If you've eaten more carbs than usual, forgotten to take your medications or have increased stress, your levels may be elevated. Symptoms of high blood sugar are increased thirst, fatigue and blurry vision. 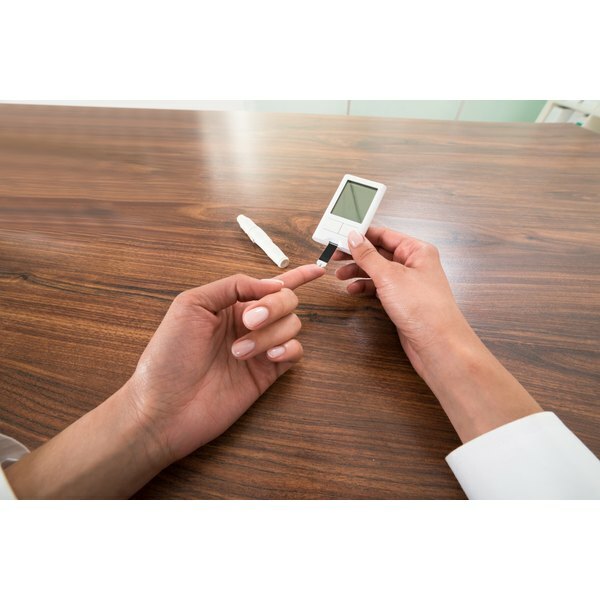 Decreasing your blood sugar quickly can prevent a diabetic coma or other complications. Take insulin as directed by your doctor. Many diabetics have a chart that instructs them to take a certain amount of insulin that changes as their blood sugar levels change. Take the amount specified for your blood sugar reading. This is the quickest way to get your blood sugar down. Drink as much water as possible. According to the American College of Physicians, drinking water can help bring down your blood sugar. Drink as much as you can, even if you think you're drinking too much. Decrease your carbohydrate and sugar intake until your levels are where they should be. Check your levels often. Exercise. It helps lower blood sugar as well as maintain healthy blood sugar levels. Let your doctor know that you had a high reading. She may be able to give you additional instructions for lowering your blood sugar and will likely want to evaluate your current treatment plan and lifestyle habits to make sure they're meeting your needs. Does Sugar in Alcohol Spike Insulin?